It is a North Indian special-occasion rich velvety dish that originated from Mughal cuisine. Its mildly sweet and piquant taste with creamy aroma will take you to another world. There are many different ways of making this dish. 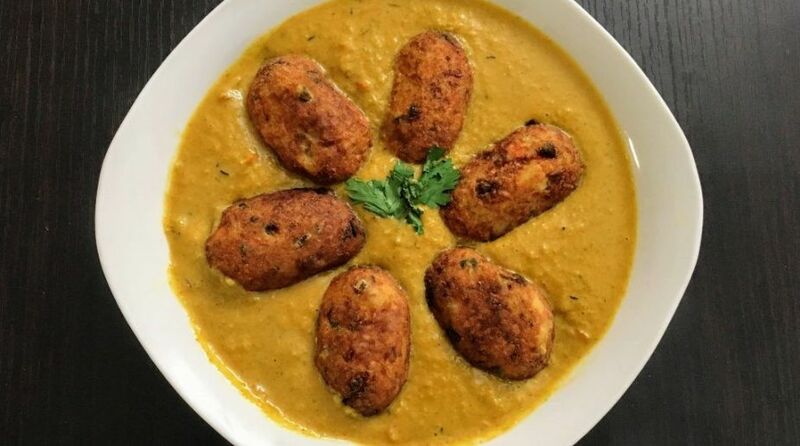 In this recipe, paneer balls are submerged in white gravy in nargisi style. · Remove the brown sides of the bread slices and crumble them in a grinder. · Boil the potatoes. Peel and mash them properly. · Smash the paneer with hands. · Mix all these three ingredients nicely together and make a dough. · Take small portions of the dough and make round balls. · Flatten the balls and fill two to three raisins and a drop of cream in the center and close them gently. · Give them around or an oval shape softly. · Coat them with cornflour powder to bind properly. · Heat the oil in a pan. Put a small part of the dough inside. If it comes up, that means that the oil is appropriately hot for frying. · Fry them until golden and keep aside. · Soak the cashew nuts in one cup of milk for an hour and make a paste along with the milk used for soaking in a processor. · Boil water in a big vessel. Put the tomatoes in it. Boil uncovered for 10 minutes. Drain the water. Remove the outer skin of tomatoes with hands and process them into a fine puree in a processor. Sieve the puree to deseed it. · Peel the onions and pressure cook them for 10 minutes adding a half cup of water, cinnamon sticks, and green cardamom seeds. · Make a fine paste of these onions along with the water used for pressure cooking using a processor. · Take a pan and heat ghee. · Put ginger and garlic paste in it and stir for five minutes. · Add besan into it and keep mixing for two more minutes. · Put onion paste and cook for another five minutes. · Add cashew nut paste, degi mirch and red chilli powder and stir for two minutes. · Put tomato puree and sugar in it and boil for 15 – 20 minutes on a low flame stirring occasionally. · Add salt and mix it well in the gravy. · Turn off the flame and keep the gravy aside to cool down for 15-20 minutes. Then add one cup of milk and two cups of cream in it and blend the gravy with a hand mixer to give it a smooth texture. 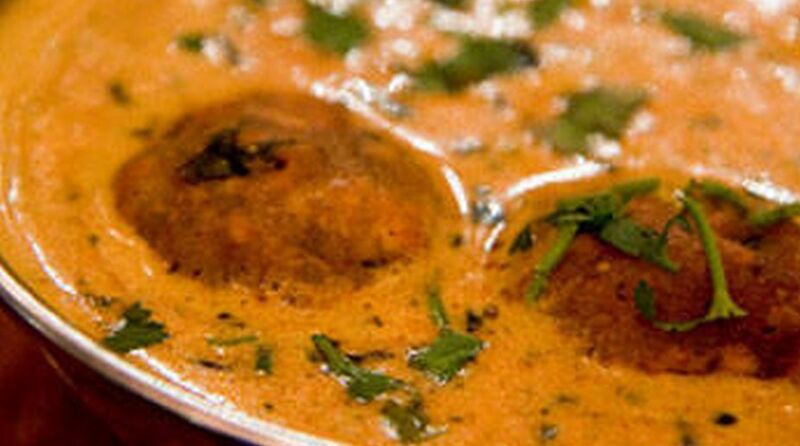 · Put the koftas in one cup of cream before putting them in gravy. 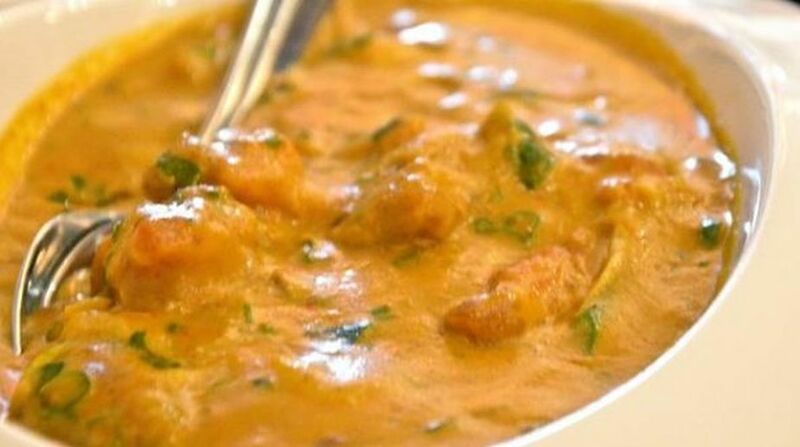 · Heat the gravy just before serving and add the koftas dipped in cream along with it. · Garnish with cream and cashew nut pieces. This dish is best served within one to two hours of preparation. If serving later or next day then keep the koftas and the gravy in separate closed airtight containers. Follow the above method of adding koftas just before serving otherwise they will get soggy.